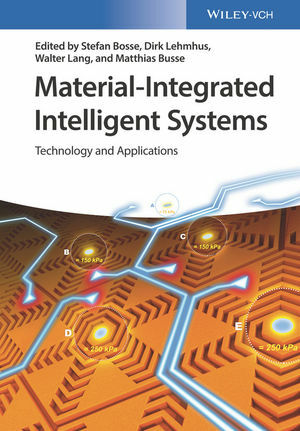 This book addresses a topic that has, to the editors’ knowledge, not been covered as comprehensively as this before: material-integrated intelligent systems. The topic links up with recent, current, and emerging trends like smart system integration, ambient intelligence, or structural electronics. Its background is the understanding that to obtain truly smart objects, it is simply not sufficient to tag them with a sensor node and some associated electronics for data evaluation – nor is it satisfactory to merely embed sensors in materials. Instead, the ultimate goal is to have materials that actually feel in a manner that can be compared with our own capabilities as human beings. The skin, its sensory equipment, and the further processing of data acquired through it is undoubtedly the most referenced model of such a material: Here we find different types of sensors situated in the most suitable places and at high resolution wherever necessary – thousands of them, actually, on your fingertip or on the palmof your hand, capturing pressure together with its first and second derivatives as well as secondary information like temperature or humidity. Besides the sensors, you have filtering of signals, sensor fusion, and information preprocessing. You have communication of aggregated information to a hierarchy of higher level control systems – your spinal cord, or ultimately your brain, with the information passed finally reaching your consciousness. The complexity of this system is such that research on its basic principles and capabilities even in humans is an ongoing effort involving researchers from several disciplines like biology, medicine, or neuroscience, to name but a few. The aim defines the approaches that lead to its technical realization, and technology does not differ from biology here: The topic is highly interdisciplinary irrespective of the world we look at, be it natural or artificial. It requires contributions, in various fields, of materials science, but also of production engineering, microelectronics, microsystems technology, systems engineering, and computer science. In fact, it needs more than contributions, but rather close cooperation. It thus faces all the challenges transgressing the boundaries of scientific disciplines commonly entails–starting from a quite natural lack of fully grasping the capabilities and limitations of neighboring research fields to the simple problem of scientific languages that just do not match and thus impede creating the necessary mutual understanding. Material-integrated intelligent systems encounter an economic environment that moves more and more toward computational capabilities and communication technologies dispersed and networked through- out our daily environment. The concept of smart dust may be seen as earlier formulation of this issue. Currently, it is moving back into focus as a potential facet of the Internet of Things (IoT), today one of the main stimulators of research in material-integrated intelligent systems.